In this part, we’ll first take a look at vertexes before we look at how to draw a simple object. Now that we’ll be working in 3D, we need to do things a little differently. In SDL2 we only used the position and size of each object. Each object was basically just an image that we drew on the screen and moved around. We never told SDL2 anything about how it looked, how big it was, etc. SDL2 simply took a texture and put it on the screen. In OpenGL we use something called a vertex. A vertex is a lot like a vector in that in represents a single point. The difference between a vertex and a vector is that a vector is just the position of a single point. But a vertex contains the vector of the point and it can also hold other things at the same time, like the color of that point, and other things we’ll come to in a later part. So, in essence, a vertex contains everything we need to draw one of these points. And when we draw an object, like a dice, we need to give OpenGL one vertex for each point. In contrast to other APIs / libraries, OpenGL is not object oriented. There’s really no objects at all, mostly because a lot of the vertex data is stored on the GPU. So instead you need to handle the models, textures, etc on our own. OpenGL does, however, have some notion of object. But instead of being a concrete struct like SDL_Texture as we have in SDL2, it’s just an ID to a type of data. The only way to refer to this data through OpenGL is by using ID’s. This is mostly because the objects are stored on the GPU, and you want to keep them there without transferring/streaming them back and forth. So let’s take a look at two of the most important objects we’ll be using in OpenGL. In order to create a VBO, we first need some data. So let’s take a collection of vectors and put them in a VBO. To keep things simple, we’ll just use a square. Our square has four positions, one of each corner. Let’s create a simple array containing all of these points. That’s the simple part. Now we need to tell OpenGL to create the actual VBO for us. This requires a few steps so let’s look at them one at the time. This function generates a VBO for us, so that we can store our vertex attribute into it. It also gives us back an ID for this buffer so that we can use it for referring to this VBO later. GLsizei n – the number of buffer we want. One per attribute, so we’ll keep it at 1. But if we were going to add colors, we’d use 2. GLuint* buffers – this is were we get the ID’s of our buffers back as an array. The second line creates an array for holding our ID’s and the third line tells OpenGL to allocate countVBOs VBOs for us. Since arrays works a lot like pointers in C++, we can just pass in vbo, and OpenGL will automatically give us as many IDs as we ask for. This function is deceptively simple, so it’s important to understand it because it can lead to some confusion. And if you call it at the wrong time or don’t call it, your application will most likely crash! The function simply sets a buffer as the current buffer. We use it to tell OpenGL that this is the buffer we are working on now. You might have notices the new type, GLenum. This is just a huge enum that contains all the predefined flags in OpenGL. These flags are used by a lot of different functions for a lot of different things, so I’ll just explain them as they come. GL_ARRAY_BUFFER is the value we use for vertex data like positions and colors. Now that we have bound the buffer, we can tell OpenGL to store this data for us. Now this might seem complicated, but it’s quite logical when you see what the parameters are for. GLenum target n – the type of buffer we want this to be. We’ll use the same as for glGenBuffers : "GL_ARRAY_BUFFER"
GLsizeiptr size – the size of the data in bytes. GLenum usage – how the data should be used. We will just use GL_STATIC_DRAW which means we won’t be modifying it after this, we’ll only be using it for rendering. The second argument, GLsizeiptr size, might seem a bit weird. First of all, what is a GLsizeiptr? Think of it as a very big integer. It’s basically a special type they used for when you need to store huge numbers. But don’t worry too much about this, we’ll be using it as a standard unsigned int. sizeof(GLfloat) simply gives us the size of a single GLfloat. So we just multiply that by the number of individual GLfloats in our array, square. Here’s the entire code for setting up a VBO so that you can digest it all before moving on to the next part. Think of this as glGenBuffers, only for VAOs. It generates a VAO for us to use later. The parameters are the exact same as for glGenBuffers so I won’t be going into them in any more depth. Just like glGenVertexArrays is the VAO equivalent of glGenBuffer, glBindVertexArray is the VAO equivalent of glBindBuffer. So this function sets the VAO as the active one. Note that these are not mutually exclusive, we can have both a VBO and a VAO active at the same time. GLuint array – the ID of the vertex array to bind. As you can see, this signature only has one argument. Why? 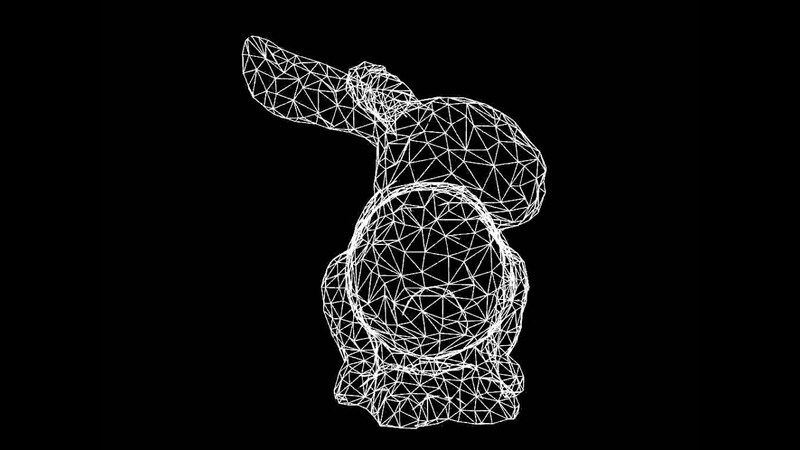 Well in OpenGL there are several data we can store in a VBO, not just vertex data. But a VAO is more of a wrapper object for vertex data, so there is just one type. Now this is where things get a little complicated. This method is what associates our vertex data from the currently selected VBO with the current VAO. We use it to tell OpenGL were in the VAO the data from the current VBO should be stored. const GLvoid * pointer – the starting point of the data to use. We don’t use this either, so we’ll just use 0 here as ell. As you can see, it’s really not as bad as it looks. The fourth argument, normalized isn’t really important for us now. And the two last ones only deals with cases were we put several vertex attributes in the same array ( like if we put positions and colors ) in the same array. The important thing here is that it puts a type of vertex attribute data form a VBO into a VAO. It uses the current active VAO and VBO, so we need to call glBindBuffer and glBindVertexArray first. Note that if you haven’t called glBindBuffer() before calling this function, it won’t work properly and your application might crash. After we’ve set up the VBOs and VAOs, we need to enable the attribute within the VAO because, by default, every vertex attribute array ( like our positions. ) are disabled. This means we’ll have to enable every vertex attribute we create and assign with glVertexAttribPointer. In our case, we just need to call it once since we are only enabling positions. GLuint index – The index of the vertex attribute array we want to enable. Hopefully this wasn’t too bad. It’s important that you understand what a VBO is, what a VAO is, what their relation is and how to use them. Knowing this will save you from a lot of confusion and frustration in the future. Before we can get anything on the screen, we’ll need a shader. Shaders are small programs that runs on the actual GPU/graphics card. We only have to define a vertex shader. This shader deals with things like moving/rotating/scaling objects. We also have a framgment shader which deals with setting the correct colors. I won’t be going any deeper into shaders than that this time. But we do need them, which means we also have to set them up properly. So I made a simple helper class that does all of that for us. I’ll post it below with the other code so you can copy it and get the example up and running. The next part will be about sharers and why we need them, so hopefully the code will make a bit more sense then. I have added setting of colors to the code, along with an example of glEnableVertexAttribArray. I hope it gives you a good idea of how to use these functions. In the next part we’ll take a close look at the shader, how to set them up and how to write our own. The code is take from here. Though I have changed it quite a lot. As you can see, it also sets color. It does this in the same way as it sets positions. I added it to further demonstrate how to bind the buffers correctly. Here is the shader helper file. Don’t mind it too much, I’ll go into more detail about how it works the next time. Finally we have something on the screen! The process is a bit tedious and not 3D yet. But we’ll be going into 3D territory soon. And that’s when things get really cool. I hope this tutorial has helped you understand VBOs and VAOs along with the concept of vertexes. My goal is to go through things thoroughly, giving you a good understanding of how things work. The better you know how things work, the easier it will be to write code. I tried copying your code, but the color data and position data seems to get mixed up. I just get a square in the upper right corner with some dark blue, cyan and violet. If I change the values in the ‘colors’ array I change the positions of the vertexes and if I change values in the ‘diamond’ array I change the colors. However, if I switch the values of positionAttributeIndex and colorAttributeIndex I get the correct brightly coloured centered square. Am I doing something terribly wrong, or is there a mixup in the code? I copy pasted your code without any changes. My OS is win10, and also I’m using glew 1.13.0 compiled for mingw. And now it works perfectly! Although I don’t know why I need those lines and you don’t. Nice catch! IThat was a slip from my part. I was probably testing what happens if you remove those lines. It seems what is happens is that the OpenGL implementation makes assumptions about what locations the attributes are in. So not having those lines is probably some form of undefined behavior. The reason why you didn’t get any colors after removing shader.UseProgram() is that since you don’t have any fragment shader, OpenGL doesn’t know what to do with the color. I had to change the version of the tutorial2.frag to 130 in order to make it work. Thanks that tip is worth gold! I am just trying to understand how OpenGL works so really, I Know Nothing :). I am running on a Jetson TK1 with the code cross compiled from linux. I had to make 2 changes to the LoadXXShader changing char*src to const GLchar *src. The Shader compiling and linking seems irreparably borked–even with straight up copy-pasting / forking the repository, shader errors are still abundant–something about not outputting to gl_Position. I guess the syntax of GLSL changed? I can not get those shaders to compile on my mac. I also had to change the version of tutorial2.frag to 130 to get it to work as expected. It doesn’t appear that we _do_ actually need a non-const string. Note that I’m running on Ubuntu Linux, so YMMV on other platforms. I decided to use #version 400 instead since it was complaining about syntax error for “attribute” in the shader, which is now deprecated and should instead be “in”. I also needed to modify the fragment shader as follows because “gl_FragColor” is also deprecated. There is a good tutorial I think which shows easier way to implement it. What do you think? which they already did these calculations for us, also you could have put all attributes in 1 VBO with glVertexAttribPointer, instead of setting it’s last two values to **zeros** every time, that’s why they exist, NOT to leave them, you should teach your students how to use functions correctly, I’m not that beginner though cause I used to learn OpenGL before, there’s no need for glDisableVertexAttribArray in cleanup() since you’re already quitting and cleaning up the application, why use #version 150?, every PC these days can run at least #version 330 core which is better if you’re worring too much about the behavior of it on different devices, version 3.3 of OpenGL is modern and fixed, I prefer using SDL2 with GLAD anyways. Mine compiles but I get a runtime error, without an actual error. Just a not responding after drawing the rectangle with different colour corners. 3D modeling using CAD is very useful and this article is very informative for the developers and I got to learn many things from here. After searching for hours this is the FIRST example showing the combined use of SDL2/opengl/glew/shaders/VBO that actually worked on my linux-box – thanks for sharing!! !